Radharani is an internationally recognized vocalist of sacred music, and CC Treadway is a classically trained sacred singer. 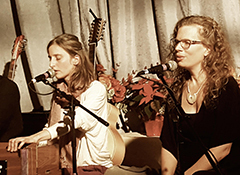 Together, they lend a unique sensitivity to the devotional practice of Kirtan in order to inspire and uplift. Preceded by Meditation Program beginning at 7:00 PM (by donation).